For over 31 years, Summit Training Source has helped stop villainous incidents and accidents from happening in workplaces around the world with the speed, efficiency, and economy of superheroes. When you need a cost effective, results oriented, employee safety and compliance training solution that offers you flexible training formats, customization, and a library of over 600 training programs… then look no further! Summit Training Source is the premier resource for environmental, health, and safety training programs to more than 45,000 organizations worldwide. If there’s a regulation, we’ve trained on it; if there’s a new technology, we’ve embraced it; and when we have a need from our fabulous clients, we’ve answered it. Located in Grand Rapids, Michigan, Summit provides proven content that delivers the business results expected in today’s competitive global market, resulting with better business outputs and the protection of workers’ lives and health. All of Summit's environmental, health and safety training programs are created entirely at Summit; we research, write, produce, and edit each course. Summit understands that each client has unique training needs, which is exactly why we offer our customizable, consistent, proven content in a format that is convenient to YOU. All format options are researched for technical accuracy, using the latest adult learning theory and instructional design techniques. Each program is filmed in actual workplaces with real workers to create stimulating visuals that increase student attention and comprehension of material presented. Select Summit programs are also available in multiple foreign languages that are fully translated, with graphics and audio, in the requested language. Summit’s U.S. based, expert account management team goes above and beyond the sale to offer you complete customer service by being both accessible and consistent and to work with you in selecting the best solution for your training needs and goals. Our U.S. based technical support team is available 24/7 for computer-based training questions by phone, email, or via the internet anytime, day or night. Summit Training Source, Inc. is committed to helping workers arrive home safely to their families every day. 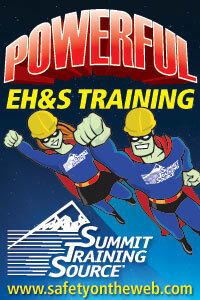 Our honest and straightforward commitment to providing you with the best training solutions at a fair price and with no hidden fees or obstacles is why over 45,000 customers worldwide have chosen Summit as their EH&S training provider. Our fundamental belief is to serve you, the customer, with the highest quality training programs available, while meeting industry needs and complying with all regulatory guidelines, and to enhance your future productivity, growth, and bottom line results. Summit's programs both comply with all current State and Federal regulations. To learn how YOU can utilize this safety superpower, visit Summit today at www.safetyontheweb.com or call us at 800.842.0466... Accidents and incidents don't stand a chance!